Ikurangi Eco Retreat in the Cook Islands. 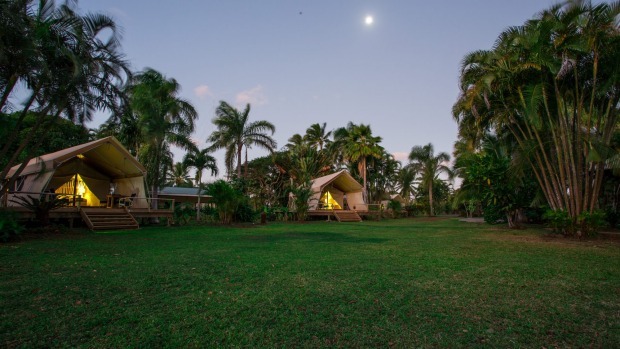 If you don't mind roosters in the night, or the smell of mangoes when you're on the can, or the Cook Islands environment minister tending to his pawpaw patch next door, then check yourself into Ikurangi Eco Retreat. You'll have to forgive the occasional wasp that floats in with all those butterflies, the odd drop of warm rain with the star-gazing at night from an open-air, claw-foot bath tub, and a compost dunny that uses banana leaves from the neighbour's plantation because there's not nearly enough sawdust on this minuscule outcrop of extinct volcano in the South Pacific. But the view? Oh, that view. Not a lagoon in sight, mind you, nor a single grain of that world-revered, high-grade Polynesian white stuff. Just Rarotonga's hinterland – as mountainous as Tahiti's and as green as the Marquesas' - and apart from the minister for the environment and his occasional foray with machete way down yonder in the pawpaw patch - barely another soul out here to share it with. For a speck of rock that's scarcely 67 square kilometres in size, Rarotonga sure has a lot of empty spaces. But where most resort, hotel and villa visitors stay straddles the more populated coastal road which encircles the island, Ikurangi Eco Retreat takes visitors to a different part of Rarotonga altogether. It doesn't take a long detour off the coastal road to escape, mind you. We're hardly talking about kilometres of 4WD-only roads over mountains here: Ikurangi Eco Retreat is just a few hundred metres inland from the lagoon, along a bitumen road. But at the retreat – near Rarotonga's ancient inland road, Ara Metua, which was built almost 1000 years ago - there's nothing much but taro plantations, locals' simple bungalows and chubby pink piglets who have a tendency to wander on the road. And unpaved tracks granting entry to hidden green valleys underneath sheer volcanic peaks - if you know where to find them. 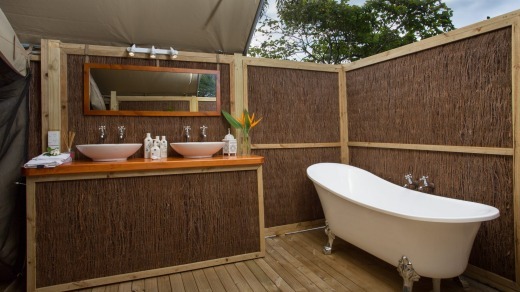 Ikurangi Eco Retreat's exclusive Ariki Safari Tent. Sure, I could've jumped straight from the back porch of my villa into Muri Lagoon this morning if I was staying on the beach, but at this very moment I'm halfway through a breakfast platter of mango and fresh-made coconut yoghurt and I'm looking out towards one of Rarotonga's tallest mountains, Mt Ikurangi. It's a misty, triangular peak of wild green jungle and black rock escarpment that's circled by snow-white tropic birds that look luminescent against the early morning sun rays. There's a yoga tent right beside me too, should I prefer to see Mt Ikurangi from a different position (upward dog, perhaps?) And round these parts, tourists don't wander across any private moments. Things could be a lot worse, I reckon. Ikurangi Eco Retreat is what can happen when a homesick Cook Islander longs for her island. On the night before her return to Rarotonga - after a 12-year stint working in Wellington – Luana Scowcroft met English lawyer Matt Scowcroft at a bar. She enticed him with a photograph of her home. Six weeks later, Scowcroft was here, his native Bolton in England's chilly north never further from his life plans. With a burning desire to try something innovative in Rarotonga, and with a passion for the environment after time spent working for Greenpeace and the Green Party of New Zealand, the Scowcrofts stumbled across the ideal property, and an idea to establish just the second luxury safari tents accommodation option in the South Pacific. And the Cook Islands' first purpose-built eco-accommodation. "I guess I always dreamt about going on safari," Luana Scowcroft says. "There's no lions, but we've got the romance of the South Pacific." But breaking new ground on a tiny South Pacific island doesn't come without its fair share of anguish. Nothing is simple round these parts. 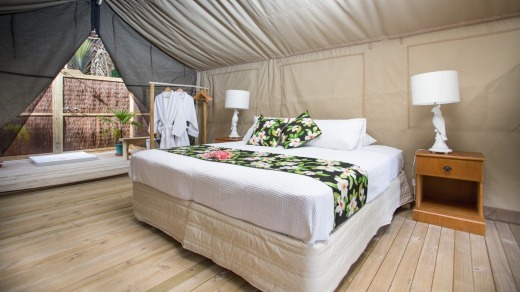 For starters, anyone starting a luxury safari tent business should probably have tents. After months of researching every type of tent on the market, the couple ordered five from South Africa. The tents didn't make the journey across two of the Earth's largest oceans. A desperate order was made for replacements. Six months after the tents finally turned up, the eco resort was open for business. And already – just six months or so on – you better be sure to book well ahead. You sure don't have to be a camper to stay here. Any reservations I have about 'roughing it' are pushed aside the moment I arrive outside the most luxurious of the safari tents, the Ariki Safari Tent, my home for the next three nights. Chickens with their just-hatched chicks wander across my path as I stroll under a gigantic mango tree to an enormous tent supported on a timber deck. There's a spacious front patio with a lounge that's under cover, and inside a king size bed sits atop polished timber floors. But it's the private ensuite that gets me, it's set inside a private garden in the open air so I can have my showers and my baths under the stars, or out in the sunshine. I was born and raised on this island and while its lagoons and beaches have always been the crowd pleasers, for me it's the barely-discovered-yet hinterland that's always been Rarotonga's best attraction. Each morning, just past dawn, I head for the yoga tent beside me to start my day stretching out my kinks, staring at the mountains. There's a cross-island walk that's popular on Rarotonga, but this aside, few people have ever accessed these rugged peaks. There's few paths into the hinterland, just non-signposted entrances to valleys beneath the escarpments and the peaks, where you can sit and marvel at their scale. In the evenings too, I like to look out at them - while the lagoon on Rarotonga never stays static for a moment, you never dare turn around from this view either lest you miss a ray of afternoon sunlight light up a dark mountain face, or a bird you haven't seen before fly across a green valley you missed earlier. In keeping with the retreat's eco principles, guests can use bicycles free-of-charge. I spend hours pedaling the Ara Metua, passing pigs and goats and no cars, talking to locals tending tiny plots of farmland, and venturing up bumpy side roads deep into water catchment areas – surrounded entirely by mountains and running streams, with no company but the occasional farmer and mosquito. There's lots more to do here – Scowcroft organises yoga classes on the property, and excursions to day spas, and to the Whale Centre, and to the cross-island walk and much more. But I can't help noticing that most guests who stay alongside me are barely budging at all; I guess they'll soon be out there at a hotel by the coastal road. But for now they're content here amongst the pawpaw patch, and under the mango trees, taking in a hinterland most tourists turn their backs on, lured by all that Polynesian blue. Yopen air ensuite bathroom at Ikurangi Eco Retreat. Ikurangi Eco Retreat offers the exclusive Ariki Safari Tent and four luxury safari tents, with tropical breakfast delivered each morning. They also offer studio accommodation, see www.ikurangi.com (they have a yoga retreat from February 13 to 20). Craig Tansley travelled as a guest of Cook Islands Tourism.